Approaching my ideal high heel height! Whenever I mention that I lost some weight, someone asks what is my regimen for weight loss. I have described my regimen a number of times in the past (as recently as January), but I am happy to repeat it for those who missed it. My dieting method is not ground-breaking. Cut out sweets, reduce my bread intake and don't eat in between meals. I seldom drink alcoholic beverages, so for me, there is no gain in avoiding booze. On weekends, I often eat only two meals instead of three. And I walk at least one mile per day. I am approaching my all-time lowest weight as an adult, which I achieved back in the summer of 1970. I hope to equal or break that low point by the True Color Conference on March 17. Thank you all for the congratulations on my impending semi-retirement. I am still sorting out what I want to do when I semi-retire. I mentioned being a trans fashion consultant (helping trans girls get the girl in gear) and being a saleswoman at a woman's clothing store (I already got the green light at a local Dress Barn if I choose that path). But number one on my list is doing Trans 101 training for businesses and organizations seeking such training. There may not be a big demand for such training, but I would be happy with one paying gig per week along with some pro bono work. I asked a long-time acquaintance in Human Resources how viable this career choice would be and she is researching it for me. Abby at Vivian Lou wrote in her weekly e-mail, "Why is it that some women are most comfortable in kitten heels or low wedges, while others feel right at home in 4 inch heels? "Dr. Emma Supple, a London podiatrist, says it’s all in the structure and flexibility of your foot. "When relaxed, your foot has a natural incline. This is the position in which your foot feels most comfortable. It is also your ideal heel height according to Dr. Supple. "Using this natural incline theory, the ideal heel height is the length between the bottom of the heel and the ball of the foot (where the foot bends when wearing heels)." Find out how Abby measured her ideal heel height here. For what it's worth, I performed the test and accordingly, my high heel height should be 6 inches! 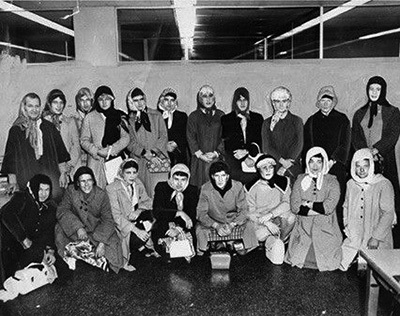 Drag Net – Los Angeles police femulated in 1960 to catch purse snatchers. When do we see before and after pics? Off topic: do you wear perfume? If so, brand? Click here for before and after pics. Chanel No. 5 is my scent. Thanks. Wow. Now looking forward to the "after weight loss" pics!